This is the only time I did work this weekend. Wow, back from Stumptown, which was a blast. The reading went well, thanks to my dad. It was a great chance to hang out with comics friends who I haven't seen in so long. And Portland is an awesome city. I love the architecture, the signs, the food, the beer! Excellent! The weather was so great this weekend, not raining as the meteorologists on the Weather channel had supposed. I'll definitely be back soon. Hope to see you at Stumptown, maybe? Also, do we all have to know how crappy her investments are doing? No! 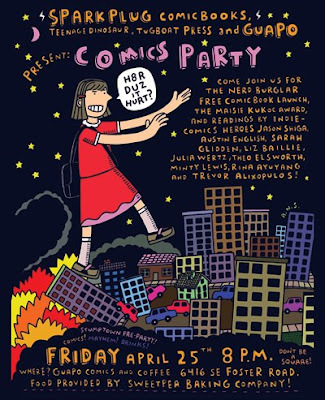 Hello, no doodle today, because I wanted to tell you of a reading I'm doing up in Portland this Friday, April 25th, at Guapo Comics to kick off the Stumptown Comics extravaganza. I'll be reading pages of a story that I'm (still) working on for Namby Pamby #5. Comics wonder-stars like Jason Shiga and Alixopulos will be there to read from their latests books too! So hope to see you there! I've never done a reading before, so at least show up to cheer me on while I make a fool out myself trying to speak in my dad's voice. Also, in other news, my minicomic Doodle Daze was nominated for a Kukoc Award. As Lark says in Christopher Walken's voice "Wowie, wow, wow!" ...because I surely haven't forgotten this blog. I've been on a personal deadline to get some stories done. I was supposed to finish one story this weekend, but the nice weather made me forget it! hee hee. 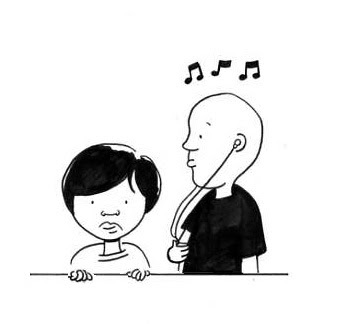 But here is one panel from the secret story! (I actually drew a doodle for today, but it was scanned very bad indeed! When all else fails, just draw your desk. Jupiter, upstairs. From last night's comix jam.